Delhi is the trade center of the country and it witnesses a huge number of tourists every year. It is a great place for foodies and is also one of the best shopping destinations. Wholesale Market of Sadar Bazar is the prominent place for shopping household items, stationaries, kitchenware, custom hand-made embroideries, cosmetics and so on. If you are not visiting here then literally your visit to Delhi is incomplete. This market is really crowded during the festival seasons like Christmas, Diwali, and Holi. You have huge cracker stores step up here during Diwali. It also has special home decor items like Christmas tree, bells, stars, etc that are exhibited near the arrival of Christmas. So don’t miss going Sadar bazar this time before the beautiful festival arrives. Sadar Bazar remains shut on Sunday but the other days are for the public because they work according to the ease of the people. On the weekday’s people can arrive here at 11:30 AM and this continues till 6:00 PM in the evening. People can easily arrive here on these time slots and enjoy a cheap and tension free shopping. How to reach Sadar bazar? How to reach Sadar Bazaar is a general question for new visitors but this is very easy because it is near the railway station and people can get local trains. The distance from New Delhi Railway station is only about 4 Km. It can also be reached by private vehicles. Parking is available at the Qutub Road. Connectivity through metro for Sadar Bazaar is from two places and they are Tishazari (Located on the Red Line) and Ram Krishna Ashram Marg (Located on the Blue Line). Apart from that people can also reach by auto and buses. Both AC and non-AC DTC buses are available. Sadar Bazar is the heart of Delhi right from the pin used in the house to the fancy items all are sold here from 10rs to as high as your budget allows. To experience the real feel of it you need to be the bargaining Ninja warrior who knows the real bargaining potential. Now if you are wondering how to bargain then don’t worry, We are here to provide you the best pro tips that you can use and get your items for the price you wouldn’t have thought of. The best option would be buying things in bulk but if you are not looking for bulk then these tips will help you for sure. Now you liked something in the market, and you definitely want to buy it, so just ask the shopkeeper about the price it is. He will definitely tell you to take it, we will offer you a good price and all hs great marketing skills. But are not supposed to hear all that just tell him to tell the price because you have seen this in the other shops also. This will lower down him to a good price. Now, he has quoted you a price that can make him get a good profit. So now you have to judge what is the actual worth of that product. Once you have thought of it just hold and act of seeing other things. This will make the person feel that you are looking for many things and may buy multiple things. Now if you really did not like anything else then just go a little lower to your expected price like if he quoted you the price of 500 and you feel the worth of the same product is 400 then quote even a lower price which is 200. He might be rude or he might say give a little more. But stick to that price for a little time. Don’t panic and repeat the price. I know you liked the item a lot but you are not gonna express or show that to him. You are gonna act like you are not interested in that item and you are familiar with the market. Don’t act like a newbie, just try going to the next shop or maybe see around. This will make him feel insecure about his competition and he might offer you a lower price when you go again to him. Maybe desired your price or a little near to your price. Once the shopkeeper says a final price and you think it is good enough, then just grab it. Mostly the chances are that you get at a half price or maybe near to that. It is gonna be a great deal for you just make sure you don’t just land up taking things at the offered at the first price because of its all about getting the best value out of your money. Sadar Bazaar is the perfect shopping destination for retailers because people are able to get the commodities on wholesale prices. This is the factor that has made this market popular among the folks and this is a transaction junction of Delhi. Including household commodities, people can purchase jewelry, computer associated articles, and many other things. This place is for the shopaholics and it has really created a difference. Leaving Sunday it is open on all the weekdays but the amount of shoppers never decreases here. We all know how expensive crockery can be at times, but when you are at Sadar Bazar you need not to worry about it because you are going to get so amazing crockery at a great price. There is a huge lane in Sadar Bazar that exclusively sells crockery and its all imported from China and other countries. You have many options to choose from. You get crockery set from 100 rs also. I know this is hard to believe but it happens and it is beautiful to shop your heart out here. Sadar Bazar is also very famous for the plastic things that it sells, be it tiffin boxes, buckets or anything that is like a daily need and come in plastic you will find it here. It also has it has a huge market of daily household plastic needs like buckets and stands. People do come here to get daily needs for a good price. If you have a little one at your home then you definitely need a lot of toys all the time so rather than going and spending a lot in those fancy stores you can come to Sadar Bazar and get into any toy shop you will get all your list done with almost half the price you might have thought. It is a good store to get great china toys that are actually very interesting and good for kids learning. I hope we all know Khari baoli the place that is famous for all the masala which is not far from Sadar main market. So if you are going to this market you can get the pure Indian spices here and make your masala shopping worth. You get all the blended masalas that define a perfect Indian food. If you are a person who loves buying the let her stuffs like jackets wallets and belts then this is your place for sure we all know how expensive it can be buying leather things so you can go to this market to buy all the beautiful leather collection at a very affordable price. Sadar Bazar also offers a huge market of shoes for male where one can get good shoes and also an unable fact that you can also get daily wear footwear at around 20 to 30 rs also. It’s hard to believe but Sadar Bazar offers it too. You have a street where you have street vendors selling the copy of shoes. So Sadar bazar r is a must go place for sure. Jewelry and women are like the best friend you cannot complete your look without having a piece of perfect jewelry for it. So if you wanna add good jewelry to your collection then you must try Sadar bazar for sure. You have jewelry starting from 10rs and that goes to the highest amount possible. The collection here is huge and is for sure one of the best jewelry markets available. This market also has a huge range of stationery products that can be easily found. And the best part would be if you go for getting them in bulk. Because it is a wholesale market and most for buying more quantity. Be it Diwali or Christmas this market has amazing decoration and cards available in the market. You have an amazing collection of the decoration from the lights to the antics available. This market is a real hub for festival shopping. One major tip is really important for us to inform you that with so beautiful things around one has to be aware of his belongings as there are a lot of pickpockets that may rob your things and make all your mood bad. So stay safe from them by following these instructions. Now when you go to a market like Sadar Bazar you are more fascinated by the products that you find all around. This is the time where most of the loose there precious belonging like phone and cash. So make sure you place them in the right place, like maybe front pocket or handbag. Don’t ever place it in the back pockets because the pickpocket people are really very smart and might vanish your phone without you even knowing it. Sadar Bazar is a big but congested market and it’s for sure that you are gonna stuff a lot of things, so rather than holding so many small covers, it’s better you carry a bag. It will help you put all your shopping together and not mess things up. Even carrying a bag makes you feel sure about your items. We all are aware of the crowd that you can find in the market, so it’s advised that if you can bring someone along with you to grab the beautiful items that are available in the market. If you have someone it will help you in handling the crowd and your shopping. But this advice truly depends on your idea and situation. Shopping requires a lot of time and when you have so much to go around its always advised to carry your water bottle with you. Because markets like Sadar Bazar are generally very clumsy and you might not get clean water, though they are seal pack the quality might not just be right. And the place where you might get good fresh water might be having a long queue so it’s better you don’t waste your time and carry a bottle. Now, this is the closest market to Sadar Bazar and is sometimes known as Sadar Bazar only to people. This market is the market of spices and dry fruit. You get a huge variety of masala and dry fruit here. The variety it holds can also be not found anywhere in India. So don’t miss checking this place to get you some great things to be added. Khari Bowli is the street that is termed as Asia’s biggest marketplace because people can get all the spices at this place. The spices that are sold here include herbs, nuts, and other products. Dry fruits in Khari Bowli are famous, even the almonds of California can be purchased from this place. This is one of the oldest markets of the country that was developed in the seventeenth century and it is active till today. The other importance of this place is that it is situated near Red Fort and on the western end there is Chandni Chowk that is again a great marketplace. 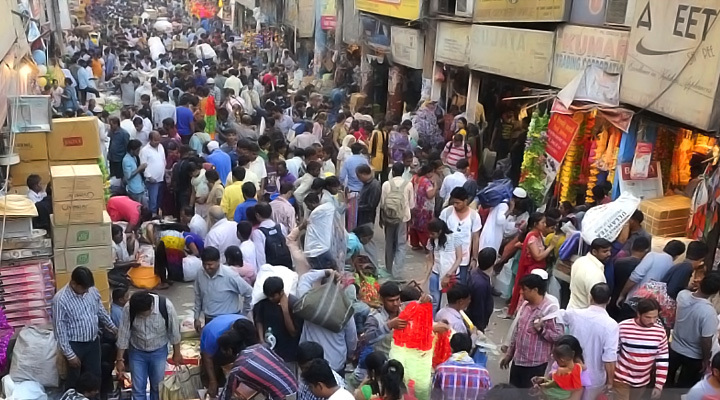 The swadeshi market is also one of the best shopping streets for people. Especially women love this market because it offers a huge range of artificial jewelry. This lane is having a local association that manages it. Apart from jewelry, people can also purchase gift items at low prices from here. Therefore, it can be said that this market is enough to create a difference among the folks. It is true that apart from shopping people can enjoy the ethnic taste that will taunt their mind. Yes, the eating joints in Sadar Bazar are famous as well as they serve tasty food and snacks to the visitors. Bakers Bite is the place that delivers some real bakery products including delicious pastries and cookies to the people. Apart from this, if people are interested in traditional Indian sweets then they can visit Madan Lal Halwai for this. Balaji Restaurant and Rewari Sweets are the other hot options that can be selected by the people. Manohar is also situated in the Gandhi market. Connaught place is the nearby place that is considered as one of the most important lace for the financial sector. Nai Sarak is an exclusive book market where all book lovers can go. Jantar Mantar is also one of the tourists’ places that has a rich history is also located near Sadar Bazaar. Second Heart cathedral is also the famous destinations that are located near it. Gurudwara Bangla Sahib is also here and people can adore its beauty. In Sadar Bazaar, one is free to take any commodity and they all are cheap at wholesale rate. Therefore, if the requirement is big and the money is limited then come here to satisfy the shopping lust. Wher should i get Stationary materials and Mobile Accessiries at best(low) price in delhi? Wher should i get kitchen containers at best(low) price in delhi? Hi, Please suggest where to buy tiny glass message bottles in the market. Also where to buy half liter glass bottles and diwali lights? P.S. Great work done. Just awesome. Thank you for stopping by…You may try this two shop for birthday gifts shop in Sadar Bazaar.